Sharing as Caring is a series of cabinet exhibitions on the theme of the Fukushima Incident in a consecutive five-year perspective. 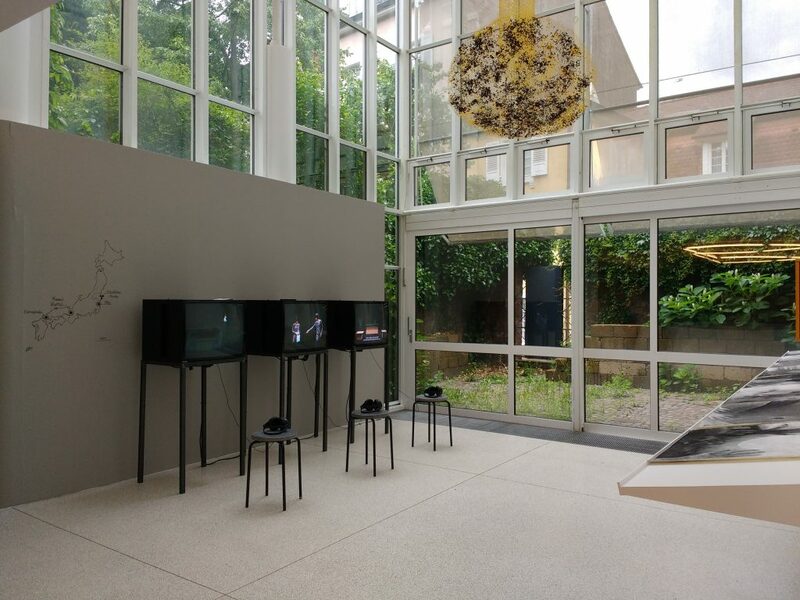 The exhibitions began at Heidelberger Kunstverein in 2012 as an annually update spanning ten weeks. 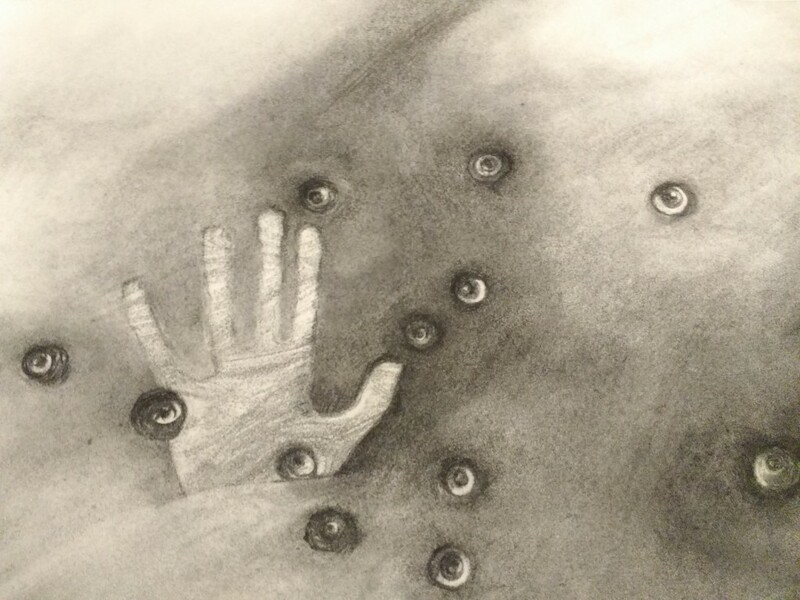 Sharing as Caring explores and reflects the reality and cultural encounters after the catastrophe. Sharing as Caring 2016 is the fifth and last show at Heidelberger Kunstverein, and it carries the subtitle Beyond Documentation. The previous shows presented art projects interacting with the residents in the northern part of Japan, collecting their voices – confusion, confrontation, contemplation, changes and challenges, and at the same time capturing the intricate relationship between emotions, economy and politics. Where the past exhibitions carried works with an ethnographic approach to collect the voices that do not easily reach to the outside of the country, the fifth exhibition focuses on the power of poetics that goes beyond documentation by any technological means. Since 2011 enormous amount of measurement has taken place to calculate the influence of the incident as well as to predict the possibility of future natural disasters. While these measurements lay out reality in the perspective of science, poetry produces completely different views on time-space. Poetical imaginary allows us to see things at another speed and in a different scale, and it embraces the potentials to navigate us as much as – or sometimes even more than – the resulting data and the measurements by the most advanced technologies. We have to remember, that the power of the imaginary – the poetics – is political. Thereby the last venue aims at fostering ‘distribution of the sensible’ (Rancière, Jacques) – not by adding more information, but by creating sensory imaginaries. Sharing as Caring #5: Beyond Documentation presents a set of art works by three international artists – Tadasu Takamine (JP), Leiko Ikemura (JP/DE) and Susan Turcot (CA/UK). 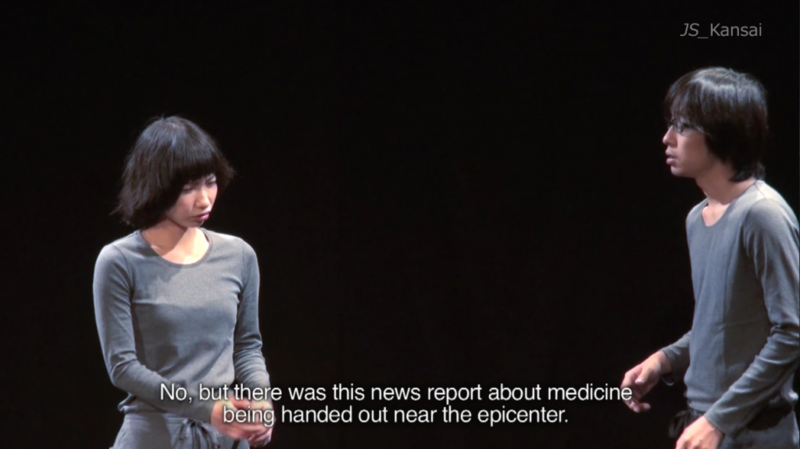 Based on the fieldwork in three Japanese cities – Mito, Kyoto and Shimonoseki – Takamine has produced a video installation, Japan Syndrom (2012), in which the artist transforms the conversation between grocery shop owners and customers into a reenactment as a theater play recorded in video. Three videos adopt minimalistic aesthetics in a style of the Beckett’s theater. The dialogue of each video reveals the distribution of misinformation and confusion and the subtle but different degrees of the ubiquitous anxiety among the people depending on the distance from their area to Fukushima. The work succeeds in extracting the sensible attitudes of daily life and their imaginaries to fight the invisible radiation. 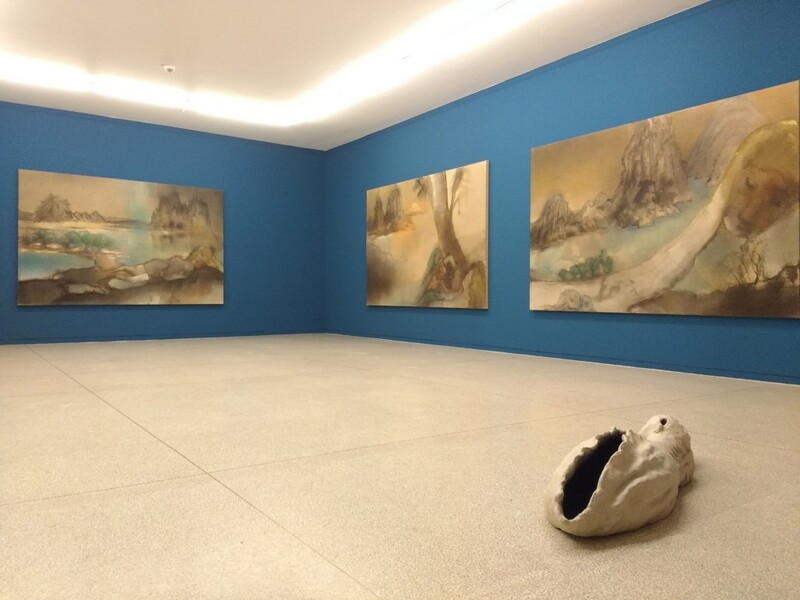 To contrast Japan Syndrom, Genesis (2014) and Zarathustra III (2014), large format paintings by Leiko Ikemura show the imaginary landscapes that gradually took shape in her mind after the Fukushima Incident. 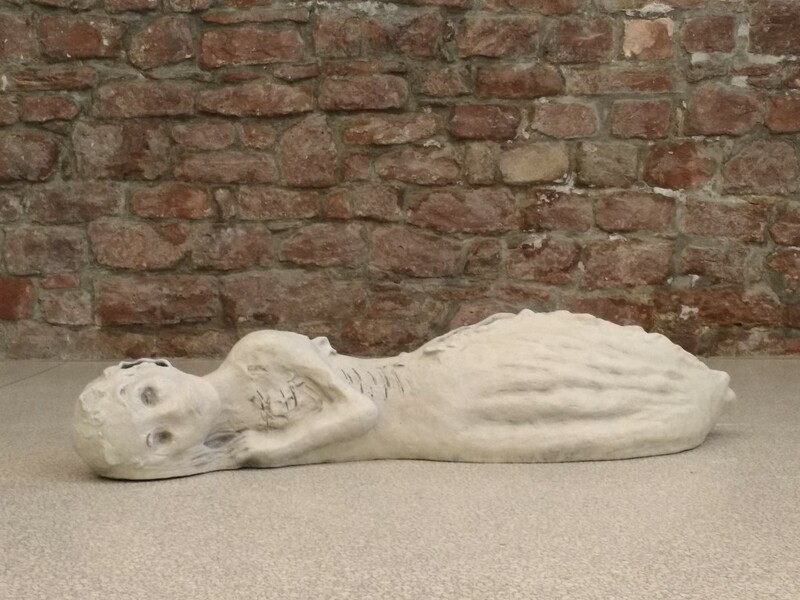 Echoing these paintings Memento Mroi (2012), a ceramic figurative sculpture, rest horizontally on a floor, seemingly listening to absorb all the sorrow, pain and confusion into a body of tranquility. Digesting the intricate relationship between emotions, economy and politics of Japan during the last five years, Ikemura explores the full potential of poetics in her works. The third work is Himawari (2016), a newly developed installation on site by Susan Turcot. 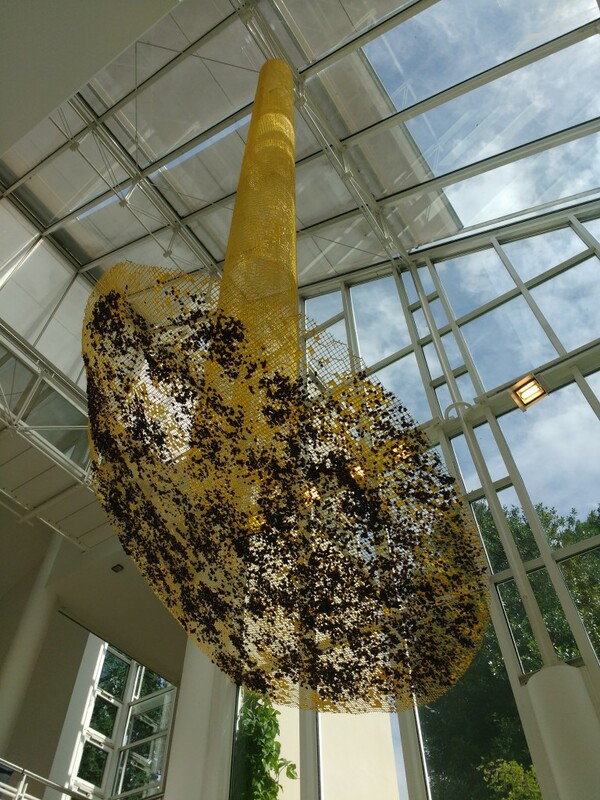 Inspired by nuclear power plants as a model of the Sun, and giant fields of sunflowers being used to pull radioactive contaminants out of the soil around Fukushima, the artist produce abstract forms of yellow sculptures suspended in the hall. Her work symbolizes the communication between the two; science and nature. With the power of artistic imaginaries mentioned above, the last show of the series tackles the ambivalence of the current situation from the perspective of poetics. The things that has disappeared, been suspended or kept unfulfilled – all confronts us the reconsideration of the last century that brought us here today. Sharing as Caring is a curatorial project by Miya Yoshida. Beyond Documentation will be held from June 18 to August 28, 2016. This exhibition is supported by Japanische Kulturinstitut Köln. All the documentation of the last five years will be published as a brochure of Sharing as Caring.